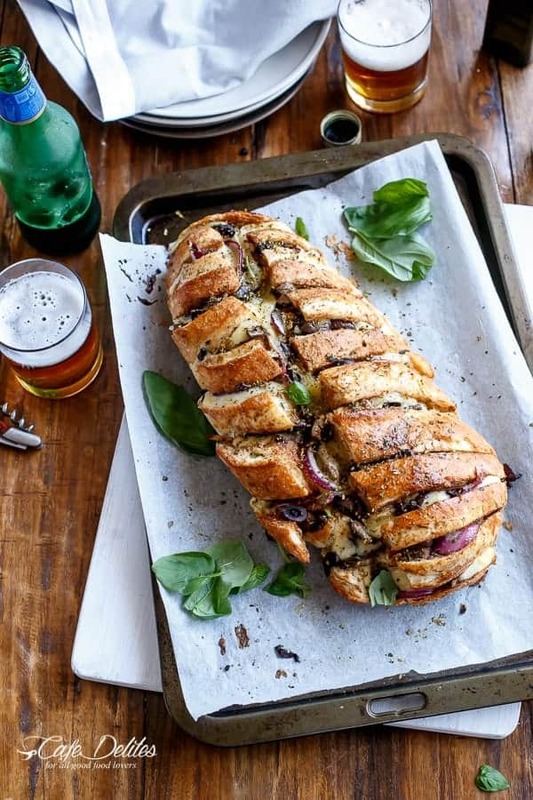 You know those meals that you need to make something in a hurry and you have no time to cook, and you want pizza but don’t have time for dough, and you find bread on sale in your supermarket and decide to turn that into pizza? You know those? No? Well, now you do. This was so quick and simple to make (of course because all you need is bread like all you need is love). And everybody knows how much I love cheese. 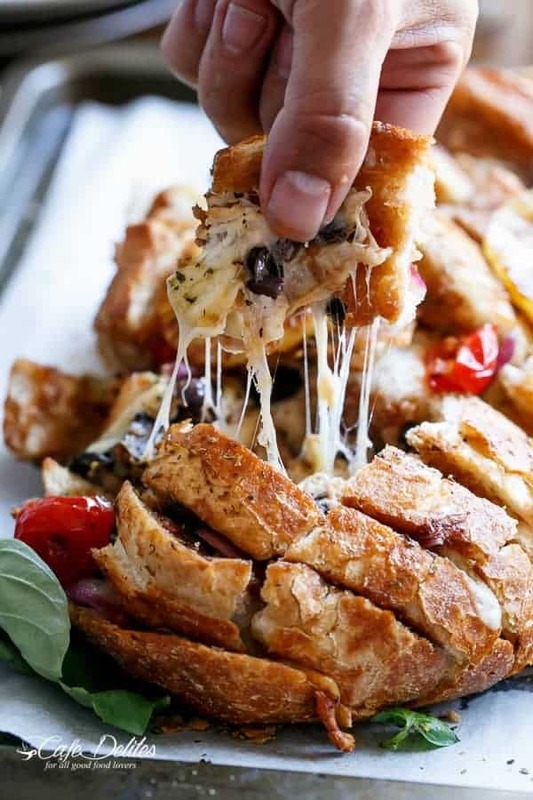 If you guys remember the Cheesy Pizza Pull Apart Bread from last year…this is kinda like that. Only better. Because Barbecue Chicken Pizza and Red Onions and Olives and Mushrooms and more. 2. Home-cooked chicken — panfried or roasted. And any crusty loaf of bread. 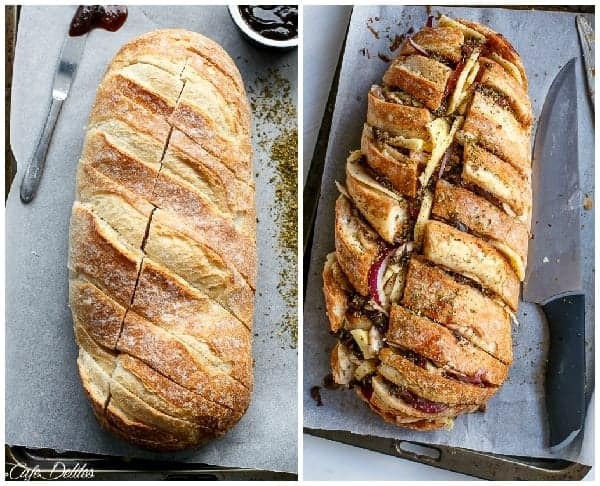 I used sourdough both times, because I love it…and this one is a Sourdough Loaf. But…the last time I used a Vienna. Both good. Both amazing, but I think I loved this size better. 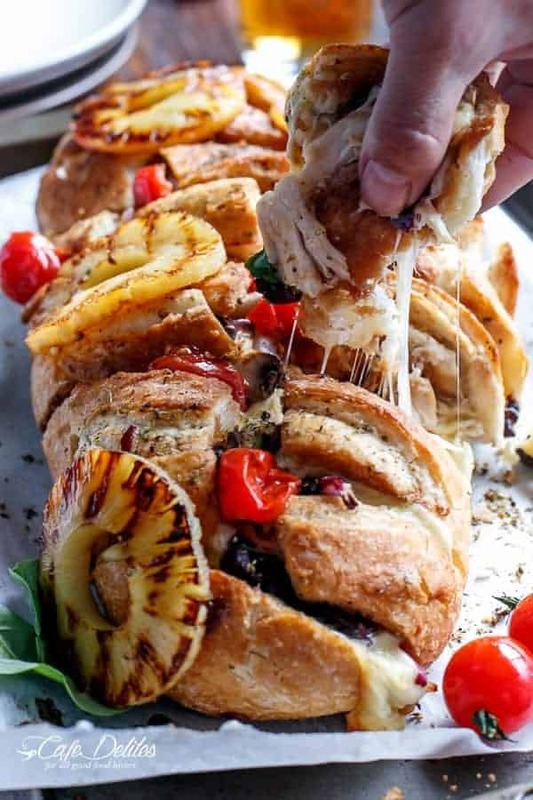 Fill it and stuff it with Pizza ingredients….and in my case I love anything Barbecue Chicken..
Barbecue Chicken Pizza Stuffed into a crusty loaf of bread -- turning it into an incredibly cheesy pull apart bread that everyone loves! Spoon (or squeeze directly out of the bottle) the barbecue sauce into each cut and spread to evenly coat the inside of the bread. 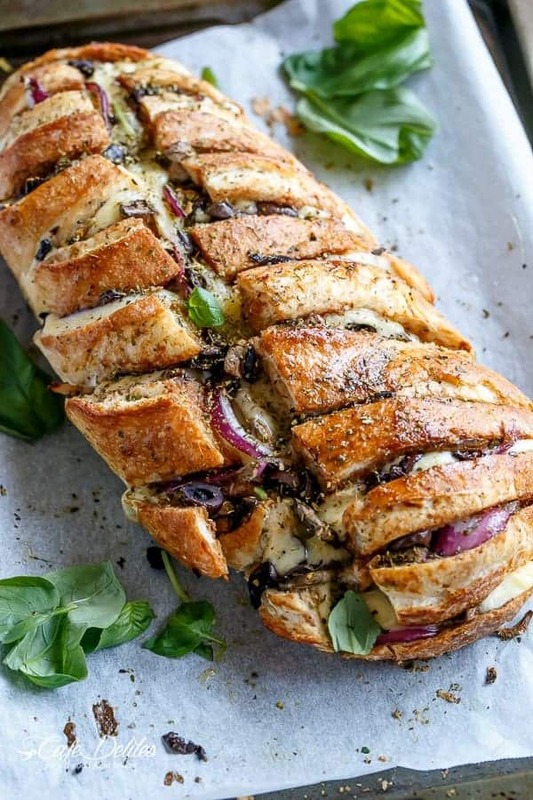 Insert the chicken breast, cheese slices, onions, olives and mushrooms into each slice/wedge. 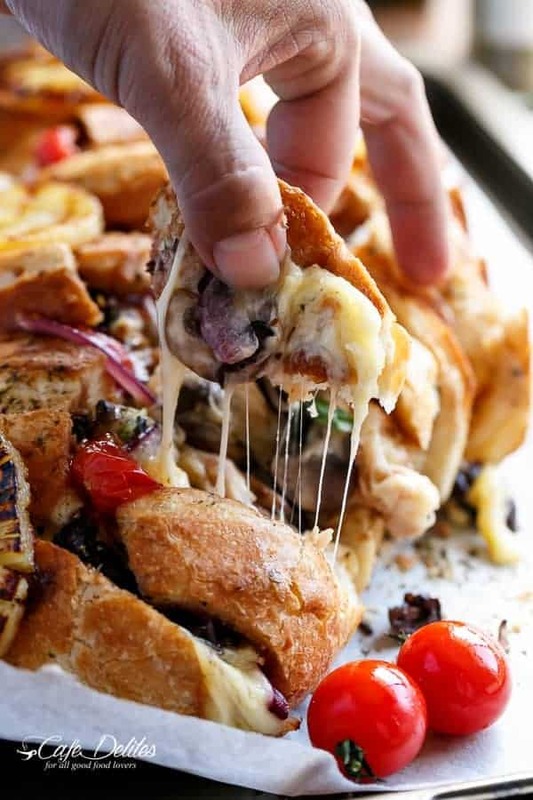 Push all ingredients down into the bread really well. 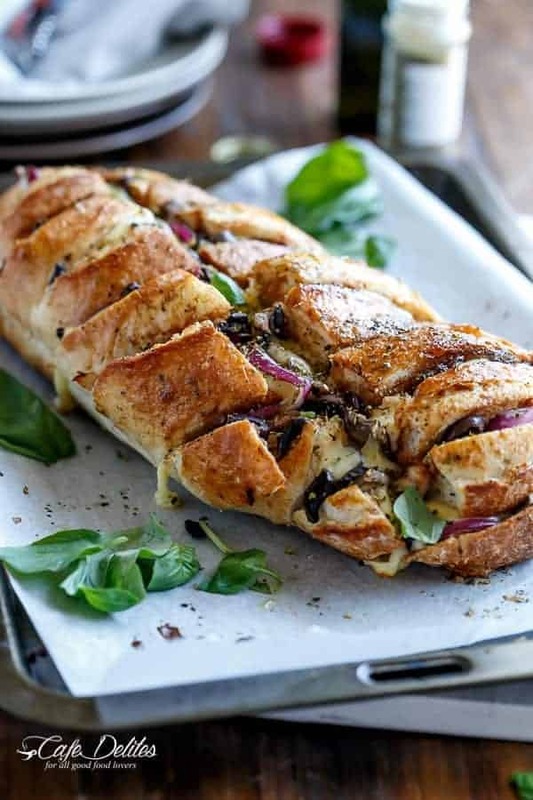 Sprinkle with the italian pizza herbs; cover with foil and bake for 15 - 20 minutes, or until cheese has melted. Uncover and bake again for a further 10 minutes, or until bread has turned golden and crispy. 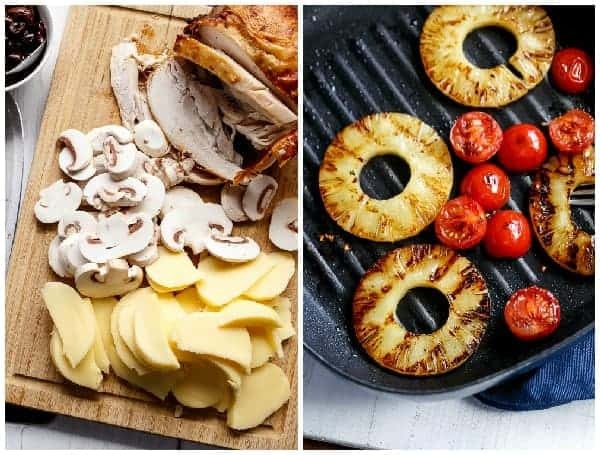 While the bread is baking; grill pineapple rings and cherry tomatoes on a lightly greased nonstick pan/skillet until cooked to your liking. 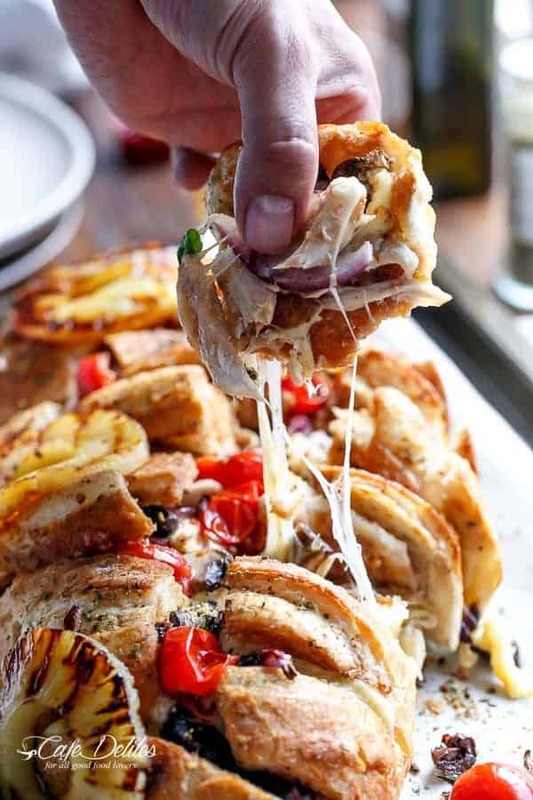 Remove the pizza pull apart bread from the oven and serve with the pineapple rings and cherry tomatoes. Top with shredded Basil leaves. 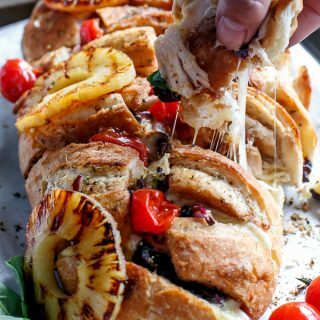 I too was drooling on my keyboard at this recipe and you great photos. I had to try it that day. I had guest coming so I made 2 of them. Started out your way it was way to messy, so I used shredded cheese then, mixed it all into the BBQ sauce and spooned it in. Then cut up the grilled pineapple, tomato and basil at the end and sprinkled that over the top. Heavenly Recipe Thank You It was a great hit here. Karina, this looks so incredible! And deliciously messy! Gorgeous pictures as always 🙂 Pinned! Aw Mila thank YOU so much! This shoot was definitely one of those, ‘second guessing myself,’ shoots! Oh my goodness that looks good! I can smell it all the way over here in the US! 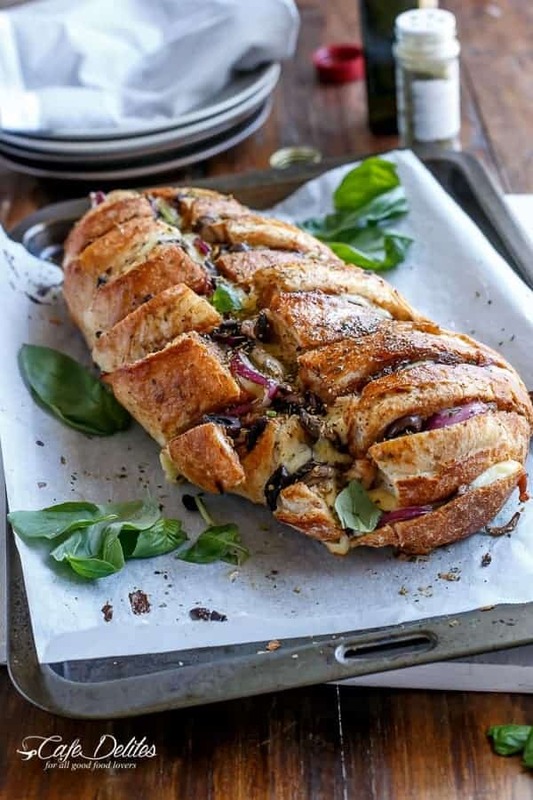 Beautiful photography, this bread could not possibly look any more gorgeous. My.God! I can’t even. This looks insanely delicious. I’m dying over here!! Your recipes are always so over-the-top-incredible and your photography is torturing. I can’t wait to try that myself. Pinned!